I am now working alongside a herbalist for a limited time for my Womb Healing, and Coaching sessions. I was asked by Herbalist Sophia to sit in my sessions so that she could observe the practice of an established therapist. I jumped at the chance of working with a Herbalist because of my own love of herbs and secondly, the effect herbs have on the body especially the Uterus and general health of women. I also feel the energy of two therapists will enhance the healing within a much quicker timeline. Healing the womb is a revolutionary act. Taking time for womb healing automatically makes one feel whole again and able to deal with the stresses of life. 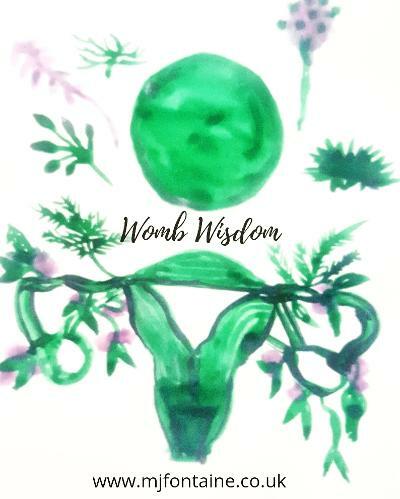 My Womb healing sessions will enable you to have more control over any Gynaecological conditions you are currently experiencing. I cannot create miracles (well according to my clients I can), but I can get you to feel, sleep and think better about your health and your body. will help you heal from that breakup or give you the confidence to set up that business or connect to your intuition? This programme will bring more clarity and help you set good boundaries which is always weaker when we are experiencing womb issues. (basically, it is going from 1 to 20 in a short space of time). Don't take my word for it here are some examples. R wanted to travel, feel more connected within her self after nine months of the creative healing method she travelled to an exotic location and is now more in her power. J, wanted more connection and confidence, more boundaries and within six months she felt much clearer and secure in her emotions. After a year working with me, J was able to set boundaries within several relationships and establish a self-care plan for herself that managed her anxiety levels. B had a chronic womb issue which has improved within three months. Lastly, T was feeling very isolated and within 6 months she had a job, her own space and is in the process of expanding her life's work and offer. If any of this speaks to you then book a discovery call with me. 2018 End of year questions. I can be pretty adventurous and other times I can be a deer in headlights (this is rare for me as I am a Leo) but when this dastardly affliction hits me it can have a great impact on my life! However there is nothing more paralyzing than fear of a possible outcome such as losing a contract, or making the right decision regarding ones career or running out of petrol whilst one is in the Blackwell tunnel! The Blackwell tunnel is 4,125 feet long. I have a new car so I didn't really know the the amount of petrol one has in a reserve tank! I am driving south of the river and all of a sudden, I am in the tunnel and the petrol light comes on. I am horrified I never go into a tunnel without petrol because well it's dangerous and irresponsible, and I am also very claustrophobic in tunnels!!! What part of me is fearful, where is it located? What is the wise intuitive part of me saying and what is it saying? Where is it located in my body? For the key was slowing down and stepping away from the panic or fear by breathing (which we forget to do) also self-talk is a really good way of staying calm. The aim is to talk to yourself like you would talk to a dear friend. This is a good way of calming yourself down so don't beat up or hate on yourself doesn’t help the situation at all. In my early twenties I suffered from panic attacks and during that time all rationality went out of the window however, a tool I used to get out of the panic state was to give myself positive and reassuring talks rather than run around and create more drama. There are times where the batons of support during fearful times have to be passed to my circle of care/friends/gypsy crew (that’s why it’s important to have good people around you). The lesson of this journey is balance and being still in a crisis if you cannot do that find a way to get there as soon as you can. What do you do to remain centred? Podcast rebranding- The Candid Conversations show Episode 17 Shame. The is the first episode of our Rebranded show now called The Candid Conversations show. Today I discuss Shame and Vulnerability and how it affects our daily lives, relationships, jobs and mental health. Trigger warning ! This episode may bring up old feelings so I have included links that you visit and use for support. 5 SELF CARE ACTIVITIES FOR WOMEN DURING THE MONTH OF JUNE. Please note this blog post was written days before the London incident on 3rd June 2017 and I believe these activities are needed more than ever. London, I still love you. As I navigate my diary this month (in between my various business ventures, planning a vacation and just trying to refurbish my kitchen on a budget), I have decided to list the five things that are going to ignite my spirit and self- nourish my soul. Most of these activities are on London so if you are visiting London pay close attention because you can find some very cost effective activities that you can undertake here. The best way to build self -worth is to take yourself on a mental health or self-care date. You don't have to fly solo on all of these activities but just once try attending an event on your own. This will encourage your confidence and enable you to discover some new concepts and hobbies you may not have thought of before. Following on from the BFI’s landmark BLACK STAR season last year, UNBOUND: VISIONS OF THE BLACK FEMININE, is a Sight & Sound Deep Focus season, showcasing films created by, and about, black women. This season will include the BFI re-release of Julie Dash’s seminal Daughters of the Dust (1991), which has been lovingly restored for its 25th anniversary. With the freedom to reflect their own lives, black women filmmakers pioneered their way to an extraordinary cinematic legacy. If you have not watched a film solo then I suggest you treat yourself to a solo date, and this film festival will give you an opportunity to do so. Alternatively choose a movie here and bring a good 'non-draining' friend who will help you maintain that good vibe and discussion after you have indulged in these thought-provoking films. Multi-sensory exhibition featuring ten extraordinary perfumes and their pioneering creators, who have radically changed our perceptions of fragrance over the last 20 years. Enjoy a Turkish treat North of the River at this traditional Hammam. This is a cost effective way of experiencing this authentic spa treatment without leaving the country. "The exhibition includes a kaleidoscope of colourful species ethically sourced from Central and South America, Africa and Asia"
Follow the trail through a tropical habitat of flowers, vines and foliage. As butterflies fly overhead, you'll pass chomping caterpillars, glistening chrysalises and busy feeding stations. My own Solstice workshop June 24th June - This month join us to meditate and paint at my studio here in London. This workshop covers Womb wisdom and the purpose of goal setting. CLICK HERE for more. Let me know if there are any other events or self-care activities you plan to do. If you have an event you would like me to include for July's 5 of the best please let me know. In the spirit of recycling and sustainability I am showing my older Full Moon circle videos. These videos only talk about the basic planetary affects and not the confidential readings. Because thereis much content available on the net I want to allow those who support my work access to some content that would otherwise be buried in the ether. Thereforeevery month I will post basic information for you. If you wish to be part of the circle which allows you to have full access to the Moon circle rituals and readings then please join our circle below. My passion is for holistic health and art. I have been working for over 15 years with women assisting them in creating a more authentic life and I can assist you to bring more Creativity, Passion and Purpose into your life. Be part of a growing community of pioneers, and join our mailing list. Receive inspiring stories from our blog sent directly to your inbox. Be inspired with our creative and motivational 'How to' videos.